Traditionally the notebooks with the largest screens are the least attractive, have the worst battery life and are heavy. They're also usually cheaper than their smaller brethren to give people a reason to buy them. Dimensions (W x D x H) 16.28" x 11.04" x 1.1" - 1.54" 16.2" x 10.9" x 1.37" - 1.70"
In both cases you're looking at over 1" thick at the thinnest point, and in the case of the HP system it goes up to 1.7" thick. Both machines start at 7 lbs and don't offer higher than 1080p resolutions. In fact, all the larger screen is useful for is reducing DPI as you can get the same resolution screen in 15-inch and 16" models. The hardware is usually fast and affordable, both machines cost less than $1000. The 17-inch MacBook Pro is a bit different. At 0.98" thick, it's only 0.03" thicker than the 13-inch or 15-inch MacBook Pro. And that's a constant thickness from front to back. The impact on how it feels is tremendous. It's the first 17-inch notebook I've used that doesn't make me want to laugh at first sight. It honestly just looks and feels like a slightly bigger 15-inch machine. Dimensions (W x D x H) 15.47" x 10.51" x 0.98" 16.2" x 10.9" x 1.37" - 1.70"
It’s also Apple’s most expensive notebook. Starting at $2499, it’s more expensive than the 27” iMac and doesn’t even come with a quad-core processor. You’re paying for the screen size, as you can get the same hardware in the 15” MacBook Pro. The added size is used for one purpose: a higher screen resolution. Apple offers a single display option with the 17-inch machine: a native 1920 x 1200 panel. It's a 16:10 aspect ratio panel, measuring 17-inch on the diagonal, resulting in a pixel density of 133.2 pixels per inch (PPI). That’s more than a 30” display. That's more than the 27" iMac. That's more than any other 17-inch notebook on the market today. Only the 15-inch 1080p panels offer a higher pixel density at 141.2 PPI. It's sharp. Apple makes the 17-inch MacBook Pro very work-focused, you get a ton of desktop space in a package that's honestly not bulky. I can't stress how pleasant it is to carry around; at a constant thickness of less than 1" it really feels a lot smaller than it is. It's the only 17-inch notebook I'd be willing to take with me. From left to right: 13-inch, 15-inch, 17-inch MacBook Pro. Note the constant height. 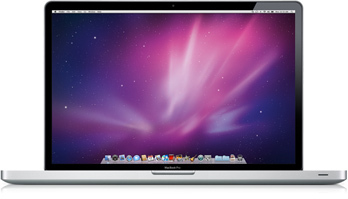 The 17-inch MacBook Pro was the first to use Apple's integrated batteries out of necessity. Apple wanted to build a slim, attractive 17-inch MacBook Pro, and cutting down on battery volume enabled that. A side effect was that the 17-inch model has impressive battery life. Paired with a 95Whr battery, Apple promised up to 8 hours of battery life - a realistically attainable figure as you'll soon see. From a hardware perspective the 17” isn’t that much different from the rest of the lineup. The system starts with a NVIDIA GeForce 9400M chipset, adds a separate GeForce 9600M for GPU intensive workloads (3D games, OpenCL apps, etc...) and gives you the option of either a 2.8GHz or 3.06GHz 45nm Core 2 Duo with a 6MB L2 cache. The vast majority of users will find the 9400M is sufficient for their needs. And paired with Snow Leopard, the 9600M in the off state doesn’t sap as much battery power as it did under Leopard. The machine starts with 4GB of memory, expandable up to 8, and comes with a 500GB 5400RPM SATA drive. SSDs are still only optional from Apple. The 17” system doesn’t come with an integrated SD card reader but it is the only MacBook Pro to ship with an ExpressCard/34 slot. Mini DisplayPort is the only way to connect to an external display, and unfortunately Apple cheeps out and doesn't supply any adapters with the machine. With a 17-inch 1920 x 1200 panel, you'll probably be fine without one though. About the only thing that the machine is missing is Nehalem, but that won't come until next year. The 17” MacBook Pro started a new trend within Apple. Integrate the battery, offer longer battery life and no one will complain. The technology soon waterfalled down to the 15” and 13” models.